Recently I couldn’t wait to try a recipe for lemon and garlic grilled flank steak topped with dollops of whipped feta. The dish was a perfect anchor for a simple weeknight meal my husband and I shared. The meat is marinated in a classic mixture of lemon, garlic, and olive oil, but gets a robust herbal accent from a generous amount of fresh chopped dill. When sliced, the rosy pink strips of steak are topped with mounds of creamy whipped feta, also scented with lemon and dill. You’ll need to plan on marinating the steaks at least three hours or longer, but you’ll discover that the marinade takes only minutes to assemble. The “quick as a wink” whipped feta requires only about 10 minutes of your time, and can be made ahead. (Any leftover Whipped Feta is delicious on toasted pitas.) This recipe serves 3 to 4, but you can easily double the ingredients if you’re cooking for a larger crowd during this new season! 1. In a large nonreactive baking dish (a 9- x13-inch pyrex dish works well), whisk together the lemon juice, 1/2 teaspoon salt, 1/2 teaspoon pepper, and the olive oil. Stir in the garlic cloves, and chopped dill. Place the steak in the dish, turn several times, and cover with plastic wrap. Marinate in the refrigerator at least 3 hours or overnight, turning occasionally. Bring to room temperature 30 minutes before cooking. 3.To cook the steaks, oil a large stove top grill pan lightly, and place over medium high heat. If using an outdoor grill, arrange a rack 4 to 5 inches from the heat source and oil it generously. Prepare the grill for a hot fire (high temperature). 4 Remove steak from marinade and pat it dry with paper towels. Salt and pepper lightly on both sides. When grill pan or outdoor grill is hot, add the steak and grill 5 to 6 minutes (depending on its thickness) per side for medium-rare. (Internal temperature should be 135 to 140 degrees F.) Remove to a cutting board and let rest 5 minutes. Cut meat on the diagonal against the grain into 1/4-inch thick slices. 5. Arrange the sliced meat on a platter and top with dollops of Whipped Feta. Pass extra Whipped Feta in a small serving bowl. Garnish the meat with a bouquet of dill sprigs. Serves 3 generously or 4 with slightly smaller portions. 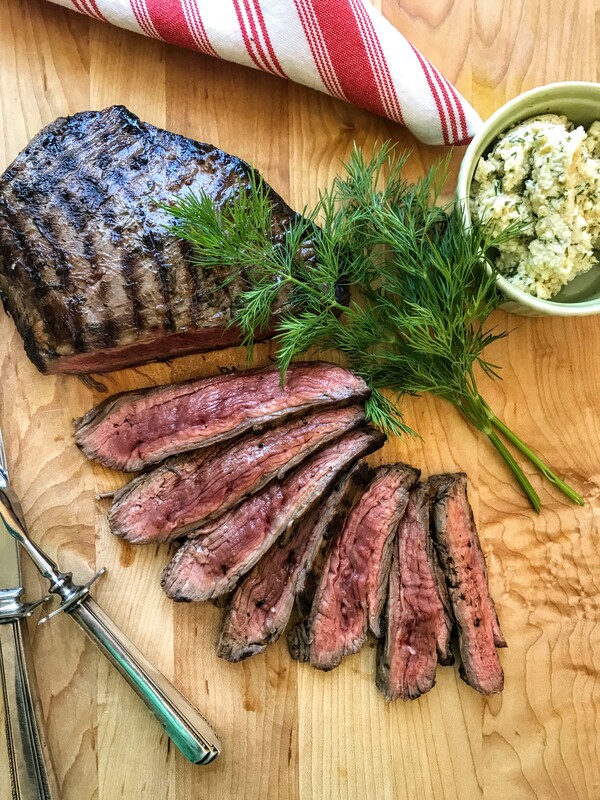 This entry was posted in Food News and tagged flank steaks, Spring, whipped feta by brosbottom. Bookmark the permalink. Just in time for grilling season and dinners on the porch! Thank you for your recipe for grilled lemon and garlic flank steak with whipped feta! Made it over the weekend to outstanding reviews. The whipped feta can stand on it’s own –with pita or crostini! Actually a spoon works—it’s that good! LOL! Thank you Betty!